NETWORK FINALS: MASTERCHEF and the SVU rerun gained 0.1 in final numbers, while the ARROW rerun lost the same. Note that in finals, SALVATION was rated as a 2-hour show with a rating of 0.5. CABLE HIGHLIGHTS: The midseason finale of OWN’s QUEEN SUGAR rose 0.05 to 0.47. 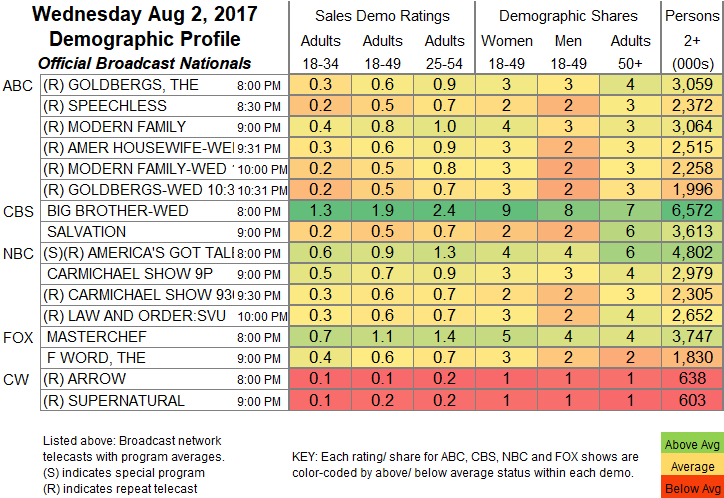 On USA, the premiere of THE SINNER was solid at 0.42, up from its 0.36 SUITS lead-in (which was up 0.02 from last week). On A&E, THE LOWE FILES premiered at 0.17, after STORAGE WARS was at twin 0.29s, up from last week’s 0.21 for a single episode. IFC’s BARONESS VON SKETCH show premiered at 0.03/130K. The season finale of POP’s NIGHTCAP was ugly at 0.01/72K, down 0.01 from last week. The season finale of Sundance’s CLEVERMAN was worse, down 0.01 to 0.01/57K. Bravo led Wednesday cable with REAL HOUSEWIVES OF NYC down 0.04 to 0.57, while ODD MOM OUT wa down 0.02 to 0.19. On VH1, BLACK INK CREW dropped 0.04 to 0.59, and lead-out SIGNED was down 0.02 to 0.34. TBS’s FULL FRONTAL climbed 0.05 to 0.45. FX’s SNOWFALL was steady at 0.42 (although down from the 0.49 lead-in it had from the theatrical movie FURIOUS 7). Comedy Central’s THE DAILY SHOW made an unaccustomed visit to the Top 10 at 0.37, while earlier in the evening HOOD ADJACENT ticked down to 0.12. Cartoon Network’s 6PM TEEN TITANS GO was at 0.37. 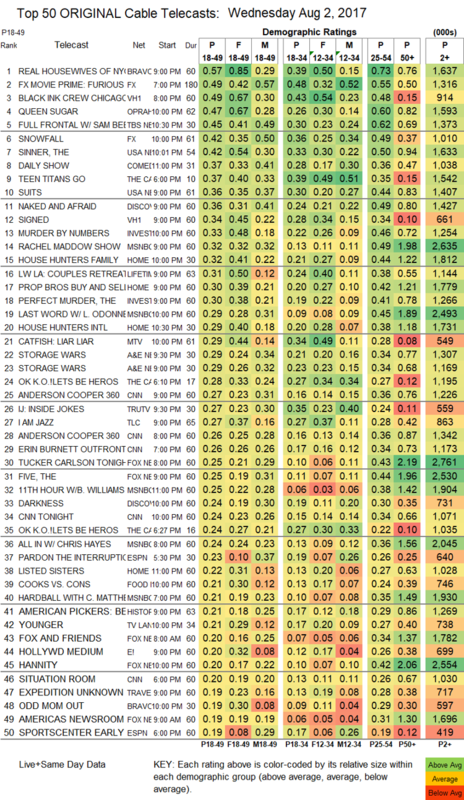 On Discovery, NAKED & AFRAID returned at 0.36, and DARKNESS premiered at 0.24. ID’s MURDER BY NUMBERS rose 0.07 to 0.33, and THE PERFECT MURDER ticked down to 0.30. MSNBC’s RACHEL MADDOW SHOW led cable news at 0.32/2.6M, above CNN’s ANDERSON COOPER 360 at 0.27/1.2M, and Fox News’s TUCKER CARLSON TONIGHT at 0.25/2.8M. On HGTV, HOUSE HUNTERS FAMILY was at 0.32, PROPERTY BROTHERS was down 0.02 to 0.30, and HOUSE HUNTERS INTL ticked down to 0.29. Lifetime’s LITTLE WOMEN: COUPLES RETREAT gained 0.05 to 0.31, and SO SHARP was up 0.02 to 0.12. MTV’s CATFISH lost 0.03 to 0.29. TLC’s I AM JAZZ held at 0.27, and the season finale of HAIR GODDESS was down 0.02 to 0.12. On Tru, INSIDE JOKES rose 0.07 to 0.27, and I’M SORRY was up 0.04 to 0.17. Food Network’s COOKS VS CONS ticked down to 0.21. TV Land’s YOUNGER shed a tick to 0.21. Syfy’s BLOOD DRIVE gained 0.04 to 0.15. BBCAmerica’s BROADCHURCH was steady at 0.04/287K.